The APG CashPlus Standard cash drawer provides unparallel quality and flexibility ensuring suitability for any retail or hospitality environment. Manufactured with a robust steel construction the CashPlus Standard provides a compact design but with high capacity storage and flexible insert design. 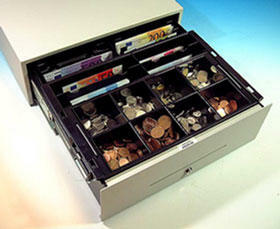 Removable coin cups in a lift out tray. Floppy note dividers to maximise note storage. Bolt down facility in base. Dimensions W415mm x D422mm x H138mm.